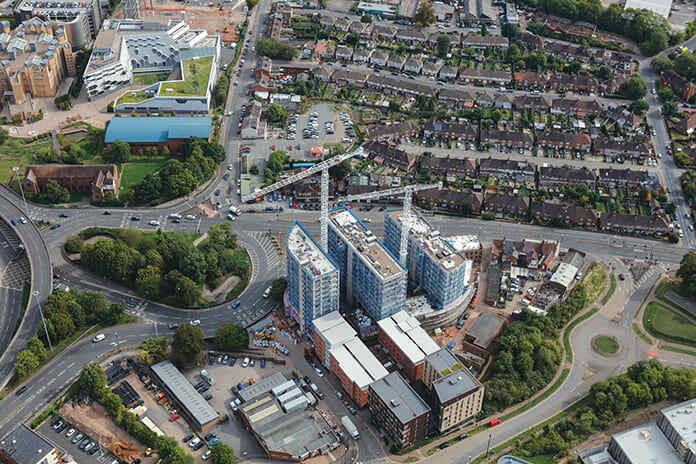 Galliford Try is using a live student accommodation project in Coventry to train students in the realities of site management – using the university’s high-tech simulation centre just around the corner. Neil Gerrard finds out more. The gateman barges into the site office and he isn’t happy. “It’s happened again hasn’t it? Someone has nicked my milk,” he complains. But the inexperienced site manager does not respond to this relatively minor complaint. He is already struggling with a project execution plan, a health and safety plan and various unfamiliar specifications. It gets worse. A QS arrives demanding that a telehandler is removed from its position as quickly as possible. He is followed by an angry mother whose daughter is being harassed by site workers as she passes each morning. Nothing is getting resolved, despite the site manager’s frantic phone calls as he tries to get on top of the situation. Fortunately, none of this matters – because none of it is real. 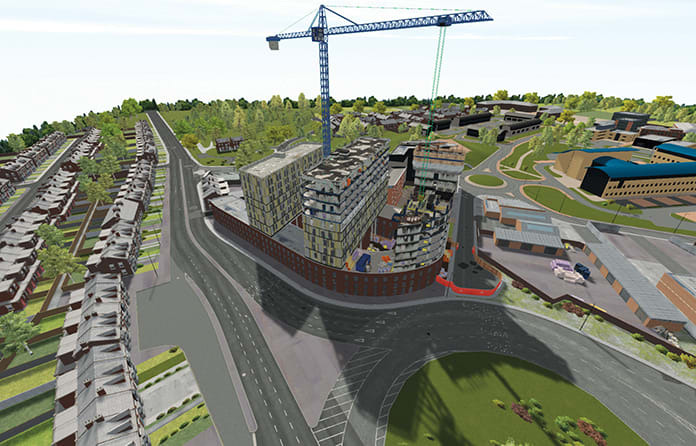 This is a simulation of a Galliford Try student accommodation project at Coventry University. The gateman, the QS, and the angry mother are all actors. The incompetent site manager is none other than the author of this article. The university’s simulation centre is being used to train students in a 3D digital environment, combined with real-life scenarios using specially trained actors. 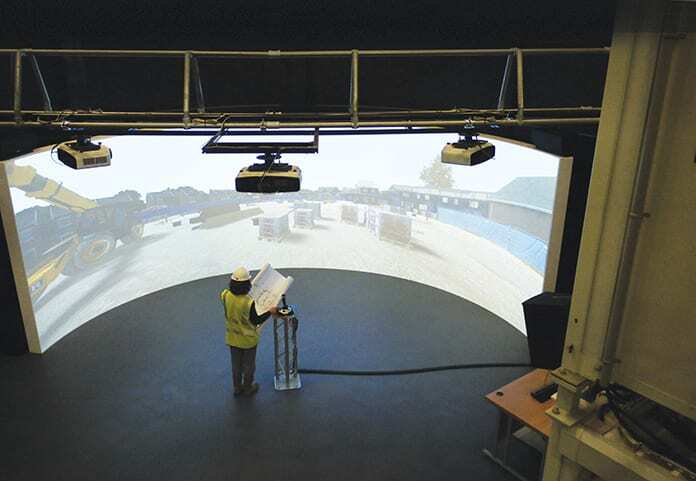 The facility has a huge “Learning Curve” interactive screen to simulate construction environments – and what makes this course unique is that the project being simulated is live and happening just across the road. The contractor is building the £52.5m, 893-bedroom Paradise Street student accommodation development for client The Elite Group. It consists of a set of townhouses which have already been handed over, along with three towers of nine, 11 and 13 storeys. On a tour of the real-life site, Galliford Try project manager David Duff and operations manager John Freeman explain that the project, started in February 2017, has been built on what was an old tyre warehouse and garage. The site was fully piled following a survey for unexploded ordnance, a legacy of Coventry’s heavy wartime bombing, and, though nothing was discovered, the investigations did mean the contractor was granted an extension of time. The buildings’ frames are traditional reinforced concrete, with slipform cores. Generally, each floor of the towers is the same, housing clusters of between 10 and 14 people sharing a communal kitchen – 111 in total. 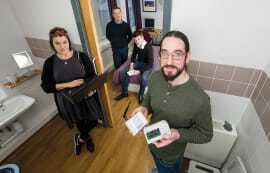 Tiny bathroom pods are installed in each room, floor by floor, using CantiDecks. With more focus on fire safety in high-rise buildings post-Grenfell, cladding used is non-combustible and all three towers are fitted with sprinklers. Hot water is delivered from a nearby district heating main, with room heating from electric panel heaters, so there is no substantial onsite plant room. Logistics has been the main challenge for the contractor, with only one walkway as access to the site, and 900 bathroom pods to be delivered. 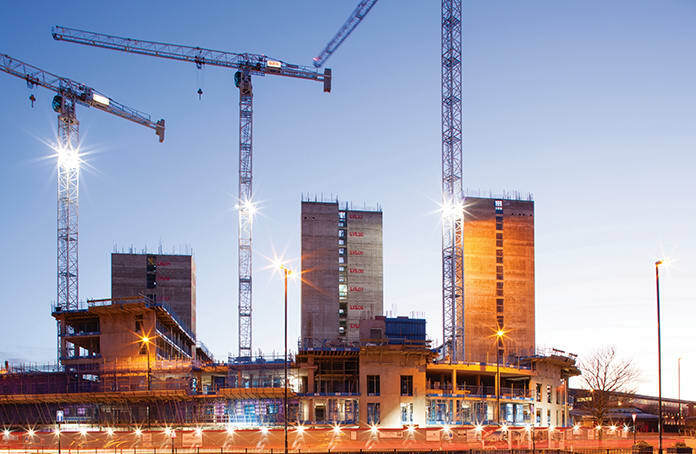 The first floor slab of Tower A was left out while the ground floor slab was installed and then protected to create a second entrance to the site, and only closed before Christmas. Final completion is scheduled for September 2019, though Tower C will be handed over in April. These challenges encountered during the build have all been fed into the simulation and the training. Duff’s predecessor as project manager, Richard Peace, has worked closely with academics to make the experience as realistic as possible, including a scenario where a telehandler is accidentally backed into a member of the public’s car. “The crashed car was a real scenario,” explains Peace, who has also replicated more common site issues. “Milk thefts are a daily occurrence, as well as contractors arguing with each other for space, trespasses on site, angry delivery drivers, and so on,” he adds. 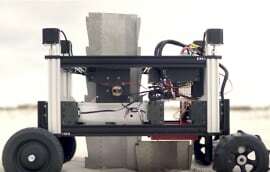 The 3D model used in the simulation was created using CAD drawings for the project. 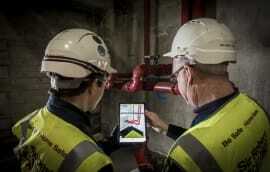 “We had the structural engineer’s drawings and the architect’s model. There was a Revit drawing in the background and it was all given to the guys at the simulation centre, which has a BIM specialist,” explains Peace. The model was combined with a specialist simulation package called XVR, allowing students to virtually “walk” around the site. There are limitations to the virtual training – there is a limited cast of actors, for instance – so students are given phone numbers of different contacts they may need to talk to, including the project manager, the hire company and other suppliers. The calls from the site manager’s office all route through to a central control room in the facility so the course tutors and actors can respond as if they were the appropriate contact. 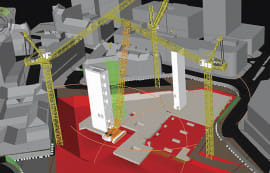 The construction programme has been partly designed to suit the simulation and reflect the widest range of scenarios possible. That means that while Tower A is complete, Tower B is in fit-out and Tower C is still being built. Then the actors get thrown into the mix. “The students get disrupted and interrupted which means they have to make decisions while also carrying out the work they have been tasked with, so it is a very busy, intensive day. We can look at different learning outcomes and then change the scenarios. This is about leadership and management and based on finding out the facts and making a decision,” says Campbell. Take the situation with the QS who wants to have the telehandler removed from site because he doesn’t believe it should be there, for example. “He just comes in and demands that the site manager off-hires something immediately,” says Campbell. “It is your site and your cabin and this guy has just walked in and told you to do something. It is very hard when you are 18 or 19 when someone a lot older comes in and tells you to do something. They feel they have to follow what they are told, so it is about giving them the confidence that you can politely challenge someone and find out what it is all about first,” adds Steve Austin, head of school for engineering, construction and environment at the university. All of this required quite a bit of faith from Galliford Try. 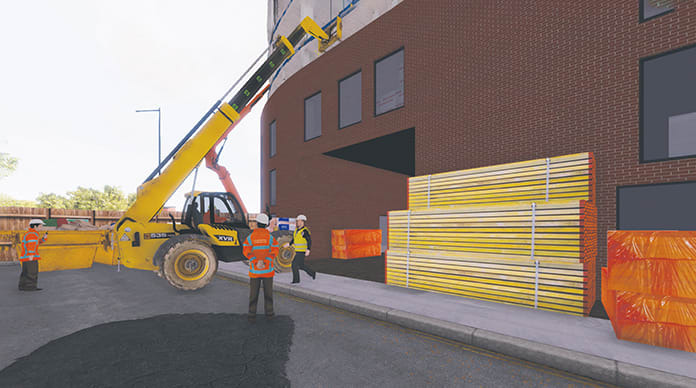 The idea for the simulation of a live, real-world project was the university’s and it has evolved into something much larger than the contractor originally envisaged, explains Jon Marston, regional managing director at Galliford Try Building. 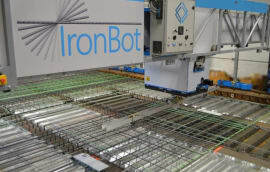 He says the firm was nervous about putting the company name to the project, particularly because the health and safety issues that the students see in the simulation did not occur on the real-life project. There is agreement among both Galliford Try staff and the students that the simulation provides a valuable new learning experience, teaching not just the theory but preparing students for the realities of working on a site – only in a consequence-free environment. Unfortunately for the gateman, that means that he never did get a replacement for his stolen milk. Coventry University’s simulation of Galliford Try’s Paradise Street project was piloted by a group of fourth-year MEng students. Tom Wood, who is finishing his MEng in civil engineering before taking up a job with Aecom, describes his experience of using it. “It is much more like real life [than a conventional university course] because you can learn the soft skills,” he says. “In one of the simulations, someone had their car crashed into. I dealt with it really badly and wasn’t empathetic enough. I was stressed and got in a flap about it but, having done the simulation, I would do it in a different way where there would have been much less conflict. “People skills in construction are really important,” he continues. “Instead of just worrying about how to get rid of the woman who had her car crashed into without admitting liability, now I would calm her down, make sure she got a taxi, and make sure she left happy. “The feedback I got was that it is important she leaves happy, particularly because she is a neighbour of the site. If she leaves happy, even if the case then has to go legal, she is not going to be an issue with getting the work done on site.